Puppy Farms - Are you unwittingly supporting them? As cute as that 'puppy in the window' looks before buying it, think about where it may have come from first !! Over the last few years we have seen an increase in the number of puppies in puppy school that arrive at their new owners in a terrible condition and very often hardly weaned off their mother’s milk. Most of these puppies are ordered from an advertisement in the newspaper and are never seen by the new owner until they meet the “Breeder” either at the side of the road or in a petrol station. We have seen puppies with distemper, parvo, mange, chronic worms and severe eye infections. Most of these puppies are very thin, scared of anything that moves, fear aggressive and very difficult to house train. After a visit to the Vet and very costly treatment, the puppy often dies. Any attempt to contact the “Breeder” or to get the puppy’s papers is useless. They simply don’t answer the phone or ever get back to you. Quite some time ago, Carte Blanche exposed a family who were “dealing” in puppies all over the country and overseas. Unfortunately these places still exist, and as the economy gets worse more people are looking for ways to make money, no matter at whose expense. In this case it is at the animals expense. We need to be acutely aware that if we or any of our clients buy puppies from Pet Shops and so called “Puppy Brokers”, we are unwittingly supporting this kind of abuse. We all need to make our clients aware of what Puppy Mills are and to try and get them to do more research into where they buy their new puppies from. Encourage them to talk to you before they buy a new puppy. While there is no firm definition of the term "puppy farm", many people use the label for a place where puppies are business and profit, not loving pets and companions. A "Puppy Farm" is usually a large facility or a plot, where a lot of different, unrelated breeds of dogs are crammed into cages or running loose, fed little, uncared for, with little or no human contact, and forced to breed heat cycle after heat cycle. In one clip on Carte Blanch, a female cross breed was shown in an old empty, unused swimming pool with her puppies. NO water in sight, no shade or food. Often the dogs are stacked in cages, faeces and urine covering those on the bottom rack, sometimes as many as five dogs to a crate made to hold one or two, and crates by the dozen. The dogs themselves are malnourished, terrified creatures who have never heard a kind word or had anyone touch them with love. The dogs are solely there for profit. To some of us, the perception of a "Puppy Farm" is not only a dirty, cruel cage facility where hundreds of puppies are born to sick and diseased dogs every year, but also those who keep a couple of dogs and breed them indiscriminately, whenever the heat cycle starts. "Puppy Farms" can be everyone from a mass producer with more than 50 dogs, to the Backyard Breeder who breeds puppies to sell without making sure they are doing it the right way. As a trainer we need to be aware that we don’t promote this in any way. In Pet Shops, we've all seen puppies (& kittens), noses pressed to the glass, eyes pleading for somebody to take them home or so scared that they just curl up into a ball and sleep. Some are so cute and cuddly that even the most rational person has made an impulsive decision to take one home. And inevitably, thousands of Rands in veterinary bills later, the poor person finally realizes that maybe buying that puppy wasn't such a good idea. Every single puppy or kitten sold from a pet store, via the Internet, from classified adverts, on Facebook etc where the seller has not idea of the home the puppy or kitten will end up in, came from a puppy farm, or a backyard breeder. No responsible breeder out there would allow one of his or her dogs to be sold like shop goods, without asking anything about the new owner – what their circumstances are or why they want a puppy. The pet shop workers will always assure the buyer that the dogs came from a responsible breeder and are highly pedigreed, it is just not true. The buyer will never see the puppy’s pedigree papers and when the puppy dies there is no recourse at all. We, know from personal experienceL– a lot of the puppies come as KUSA registered and the papers do sometimes come but you find that the breeder breeds about 10 different species. KUSA has been contacted in this regard but they are unfortunately not interested. Puppy farms are a serious problem as breeding for profits gains momentum in this day and age. "Anything to make money" has, sadly, become a motto, and the innocent animals are suffering for it. If this message reaches five people, and those five people in turn educate five other people ... maybe we can put a stop to the horrendous practice of puppy farms. 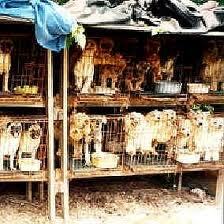 Maybe we can also stop Pet Shops from selling any live animals!! !